the structure of regular verbs, and the important verb: "to have"
The (very important) verb "to have"
So what happens when you’re still stuck on the desert island with Jens — no rescue in sight — and knowing how to say "please" and "thank you" really isn't enough anymore? When it's time to take your German to the next level, some of the most useful things you can learn are verbs. You might remember from your school days that verbs are "doing words". That means they help you to run, jump, throw, and a lot of other very active-sounding things. But there are also some mega-important verbs that you'll see all the time when you're learning any language. In fact, you've already met one of them in an earlier lesson: The verb, to be. Here it goes again if you need a refresher. Notice how the verb "to be" in the table above changes depending on who or what the verb refers to? We have the same concept of verb changes in English. Sometimes the verb changes a little by just adding an –s to the end. Other times, our English verbs change drastically for each person. German verbs change too. But luckily, they mostly follow a predictable pattern — so once you get the hang of the pattern, you can use a huge number of German verbs. When German verbs change, they drop their original verb ending and take a new ending. Can you find the pattern in the endings below? Now that you've seen the pattern, see if you can figure out the endings for another important verb, gehen (to go). Then click below to check your answer! Now you know the main pattern for German verbs! (Go treat yourself to a schnitzel.) This rule will work for a great many German verbs, but there are a few exceptions. One very important exception is the verb haben (to have). The verb “to have” is necessary for all sorts of basic German phrases. (More than you'd probably expect!) It's an irregular verb, so you'll notice that it's a little different from the pattern you've just learned. Here is how the German verb “to have” changes. Did you notice how the b disappeared in some of those? Haben is an important verb to know when you're stuck on an imaginary desert island with Jens, because you can use it to talk about how you're feeling. 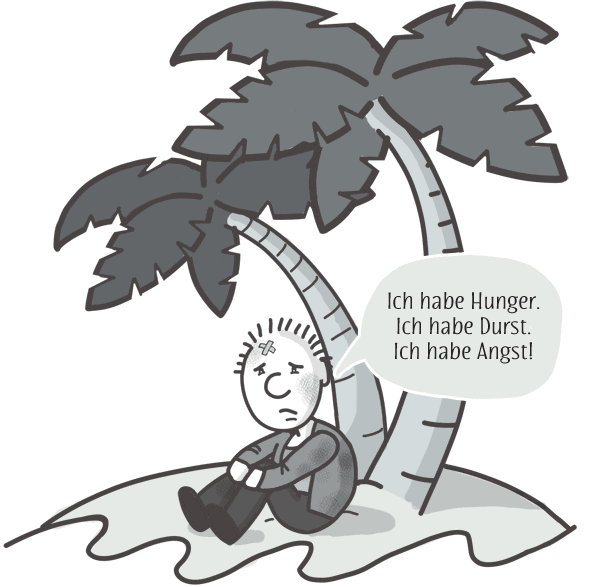 Instead of saying that you are hungry, thirsty or afraid, in German you say that you have hunger, thirst or fear. Give it a try. Tell Jens how you feel using the verb "to have". After several days of battling imaginary hunger, imaginary weather, and some strange imaginary animals, you find out there are a few things Jens forgot to mention. Really, Jens? What's inside that backpack? Ich habe ein paar Streichhölzer. I have a few matches. Guck mal! Ich habe ein Handy! Look! I have a cellphone!